A birthday though is justifiable grounds for celebrating, and being happy, and being grateful. No small thing, birthdays! And just last Friday I celebrated my 34th 🙂 This year, I opted for the quiet route…a regular day at work and dinner with my team-mate-for-life at our favourite sushi place. No rah-rah this year…but still grateful for many, many things. Now, I would love to yammer on about everything I’m thankful for, but I still have extra work to finish, dinner to put on the table (adobo! ), and another food shoot to plan***. So I’ll leave you with just one thing. A wonderful basket of organic produce delivered right on my birthday (a nice coincidence!)! 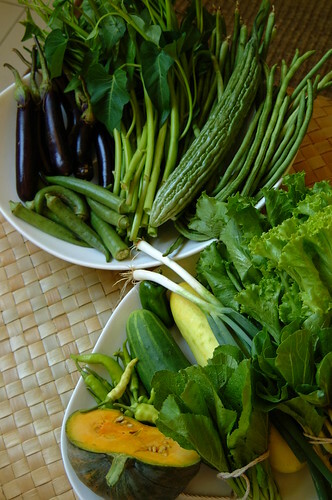 This vegetable bounty came from farm in Bulacan that practices sustainable organic farming. They deliver a weekly basket of whatever is ready for harvest. They also have native chickens (and their eggs), ducks, and geese. They have fruits trees as well, and you can order fruit when in season. And they have organic rice twice a year during rice harvest season. So far I’ve only tried their veggies but will be ordering their eggs as soon as they have some! These vegetables were a delight, and a fanstastic “birthday gift” from nature. Bright green and crisp, they felt almost alive in my hands as I transferred them carefully out of their basket. My birthday bounty: a big bunch of lettuce, kang kong (water spinach), small talong (eggplant), okra, sitaw (long beans), ampalaya (bitter melon), a small bunch of pechay (pak choi…a kind of cabbage), mustasa (mustard greens), green cucumber, white cucumber, green chilis, half a squash, 2 small leeks, and 1 tiny green pepper that snuck in! We’ve already eaten some of the lettuce, which had that snappy taste only very fresh lettuce has. I’ve also used a bit of the chilli. The green cucumber was super crunchy in our salad and I’ll use the rest of it for cucumber raita. The white cucumber is new to me and I’ll probably make another salad out of that – with vinegar and sugar and lots of black pepper. The challenge is the two veggies that I don’t eat very often – ampalaya (bitter melon) and okra…but because of them I now have a chance to try my hand at pinakbet for the first time! ***If you missed my dishes published in Yummy Magazine in September, I’ll have more coming up soon! Will let you all know when 🙂 Meanwhile, you can check out the breakfast dishes I’ve prepared in the Marie Claire October issue which also features (blush!!!) our little flat!